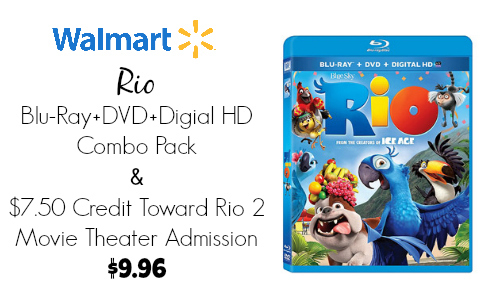 If your family is a fan of Rio, don’t miss this Walmart deal! You can get a $7.50 toward movie admission to see Rio 2 when you buy Rio on Blu-Ray + DVD + Digital HD Combo. The Rio Blu-Ray + DVD + Digital HD combo is $9.96 at Walmart (reg. $24.99), making this a great deal! The movie is rated G and has great reviews. Rio 2 hits theaters tomorrow, 4/11, so grab the deal now. Keep in mind, if you go to a matinee movie, $7.50 should cover an adult ticket at most theaters. Shipping is FREE on orders or you can get FREE in-store pick-up.